I have not been posting much, just not taking the aditional minutes to note and publish the little things I am doing. Summer is nearly closed and we can see Autumn coming in, and maybe this change will inspire me to blabber and publish more. 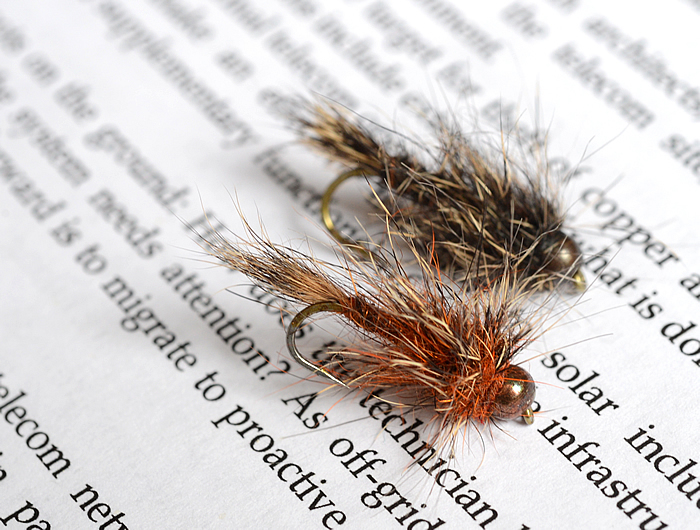 Onto fishing, though not a die-hard nympher, I continue to cleanup my nymphs. Earlier posts were the small nymphs, but I do keep some large nymphs in my box (other than stoneflies), but these are usually weighted and tied with a large and fuzzy-hairy thorax. Just as much Streamer as Nymph. So when are working the water close to your feet, dead-drift it (with a twitch (if desired)). As you work the water, and move the fly out, combine the dead-drift with a swing.